Obviously the West has been a little weaker than the East this season, but the high scoring Los Angeles Galaxy have been fairly consistent picking up points so far. 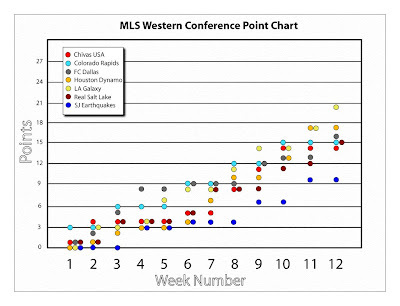 It's interesting that Chivas USA and Real Salt Lake, the expansion partners from a few years back, have been very close to each other in the standings on a weekly basis. You can also tell that Colorado hasn't put together any winning streaks. They win, then lose a time or two before winning again. They're also the only team in the league with zero draws to this point.